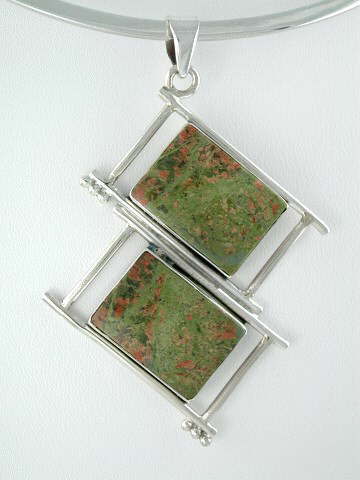 Large, eyecatching, geometric design, Unakite pendant set in 925 sterling silver. Unakite is composed of Pink Feldspar, Quartz and Green Epidote, giving it a unique blend of colours. The beautiful green and terracotta colours found in Unakite reflect its element of Earth. It is an excellent grounding stone, especially after meditation and can help disperse electromagnetic pollution and background radiation emitted from televisions and computers.